Reference number for this case: Deb-Oct-54-Avesnes-les-Aubert. Thank you for including this reference number in any correspondence with me regarding this case. Two residents of Avesnes-lez-Aubert, driving one and the other in their car, saw at night, a gleam some 40 or 50 meters in the field at the "Le Champ des Alouettes" on the road to Saint-Hilaire, in Avesnes-lez-Aubert. They are certain that he had not dreamed of. These are not pranksters and, moreover, they are considered perfectly balanced. The cas has no strangeness: a gleam in a field at night! 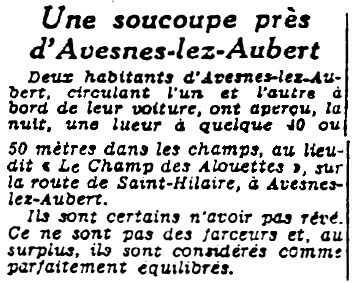 [nm1] Article in the regional newspaper Nord-Matin, Lille, France, October 3, 1954. 1.0 Patrick Gross September 13, 2014 First published, [nm1].